The offseason of Jimmy GQ has now been replaced with the realization that the newly-minted San Francisco 49ers franchise quarterback will miss the remainder of the 2018 NFL season. 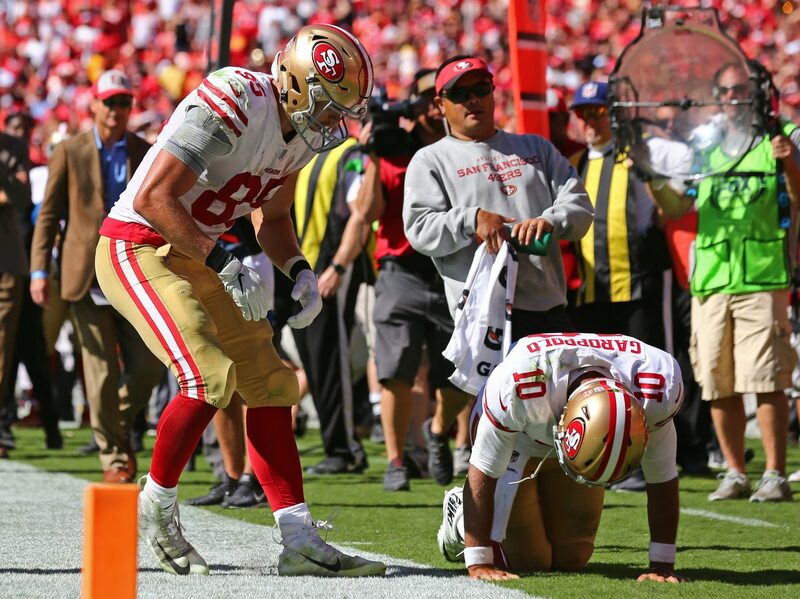 In confirming the 49ers’ worst fears following Sunday’s loss to the Kansas City Chiefs, tests showed that Jimmy Garoppolo did in fact suffer a torn ACL late in the game. Garoppolo suffered the injury as his team attempted to come back from a 35-7 late first half deficit against Kansas City. Down just 14 points in the fourth quarter, he attempted to gain more yards on a scramble in hopes of pulling the game to within one touchdown. That’s when Garoppolo’s left knee buckled on the sideline. He was immediately sent to the medical tent before being carted off to the locker room. Almost immediatelay after the game, 49ers head coach Kyle Shanahan indicated that the team feared Garoppolo suffered a torn ACL. He did. Having signed what was then the richest contract in NFL history this past February, Garoppolo led San Francisco into the season with high expectations. After struggling out of the gate with a three-interception performance against Minnesota, Garoppolo was on the verge of turning it around. He had thrown four touchdowns compared to zero interceptions in two games prior to suffering the devastating injury. With Garoppolo sidelined, San Francisco will turn to second-year quarterback C.J. Beathard for the foreseeable future. The former third-round pick from Iowa completed less than 55 percent of his passes for 1,430 yards with four touchdowns and six interceptions in five starts last season. Needless to say, Garoppolo’s injury threatens to derail a once-promising 49ers season.